With 20 years experience in all major brands of washers, dryers, electric stoves & dishwashers. 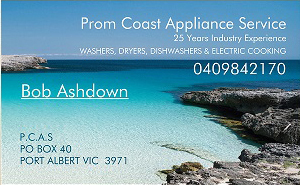 Prom Coast appliance Service can help with any problem you may have with your appliances. Being a preferred agent for most brands Bob is able to undertake warranty and extended warranty jobs.